COPS SHOOT PUPIL WITH RUBBER BULLETS! Students of Oakdale Secondary in Ennerdale supported by their parents took to the streets demanding to be built a new school. The learners say the conditions of the infrastructure at their school in frustrating them. They claim the school has been like this for the longest of time. 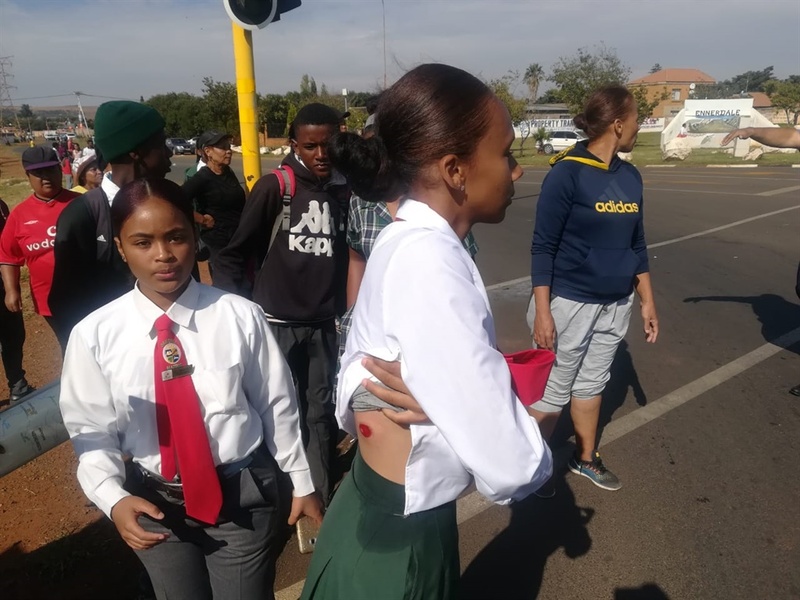 "We are here fighting for our rights, our great grand parents did not vote for us to be taught in mobile classrooms that might give us cancer," said a matric learner who was shot with a rubber bullet. The learner continued to say that the school was falling apart but the government refuses to pay attention to this school. SAPS spokesperson Captain Kay Makhubele said they received an alert of a protest in Ennerdale earlier on Monday morning. "When members arrived, they tried to disperse the protesters, but they refused. Stun grenades and rubber bullets were then used," said Makhubele. He said that a classroom was burnt at the school, but the fire was contained before more damage could be caused. "We have arrested five suspects for malicious damage to property and we will continue to monitor the situation throughout the day," Makhubele said.